Ausgehend von der historischen Fotosammlung des Österreichischen Museums für Volkskunde in Wien widmen sich die Forschungsprojekte Stadt-Land-Kind und Stadt-Land-Bild diesem Phänomen. Stadt-Land-Bild erweitert die visuelle und materielle Analyse des Sparkling-Science-Projekts Stadt-Land-Kind durch die Etablierung des Ausstellungsraums als Forschungslandschaft für Citizen Science. Im sozialen Umfeld der Ausstellung werden Sehnsuchtsbilder vom Land im Dialog verhandelt. Hier kommen Citizen Scientists mit unterschiedlichen Wahrnehmungen, Meinungen und Erfahrungen zusammen, um sentimentale und ideologisch aufgeladene Sehnsuchtserscheinungen zwischen Stadt und Land zu reflektieren und einen gemeinsamen Beitrag zu einem offenen Heimatbegriff zu leisten. Über eine raumgreifende multimediale Installation aus weitläufigen Touch-Screen-Wänden können die Fotografien des Stadt-Land-Bild-Projekts erfahren und erforscht werden. Das Programm baut auf die Durchführung von intergenerativen Bildgesprächen und Workshops sowie auf offene Forschungssitzungen zu Hochzeiten des Museums. Geforscht wird mit dem Social Image Tagging-Spiel ARTigo und mit den vom ARTigo Analytics Center angebotenen Tools zur sozialen Bildanalyse. Dabei können die Citizen Scientists sowohl Bilder beschreiben als auch die von ihnen selbst und anderen gemachten Beschreibungen statistisch analysieren. Die Teilhabe erfordert keine Vorkenntnisse. Jede/r, unabhängig von Alter oder Bildungshintergrund, kann beim Besuch der Ausstellung mitmachen. Stadt-Land-Bild setzt den intergenerativen Forschungszugang des Sparkling Science-Projekts Stadt-Land-Kind mit Fokus auf Schüler_innen und deren Familien fort und bietet allen Generationen – Kindern und Jugendlichen, Erwachsenen und Senior_innen – die Möglichkeit der Teilhabe. Im Rahmen von Workshops und offenen Forschungssitzungen sind Forschungskooperationen mit mindestens 250 Citizen Scientists angestrebt. Ein offener Zugang zur Forschungsstation während der gesamten Öffnungszeiten des Museums sowie die Möglichkeit einer Online-Teilnahme erlauben darüber hinaus die Zusammenarbeit mit einer viel größeren Anzahl von Bürger_innen. Mag. Laura Commare, B. A. soz. In this time of a digital revolution, worldwide crises and global insecurity there is a simultaneous tendency to look back. This phenomenon—called “Retrotopia” by sociologist Zygmunt Baumann—is accompanied by a longing for authenticity, simplicity and security. It depends on a glorification of conservative values of family, work and community, and is accompanied by a renewed nostalgia for life in the countryside. This phenomenon is the topic of the Sparkling Science project Stadt-Land-Kind’s new expansion project Stadt-Land-Bild. 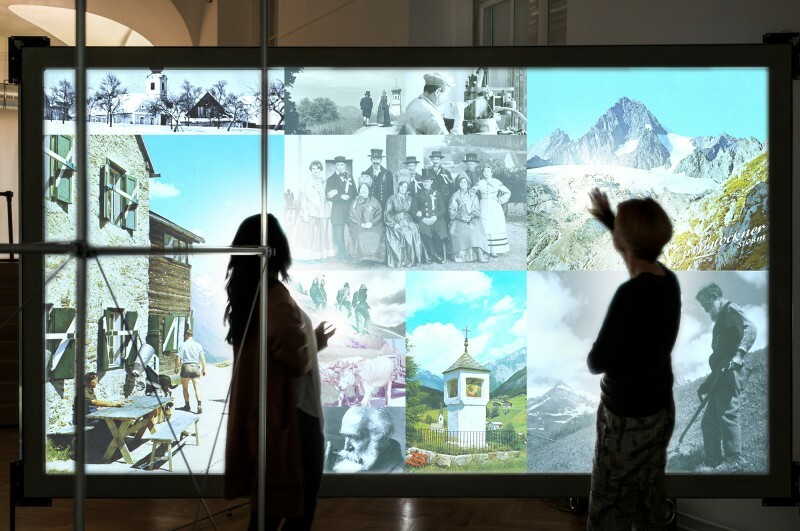 Stadt-Land-Bild expands the visual and material analysis of the Sparkling Science project by establishing the exhibition space of the Austrian Museum of Folk Life and Folk Art as a Citizen Science (CS) research setting. Within this rich, multi- sensory and social environment, images of longing are brought to life in a dialogical setting. There, citizen scientists with different perceptions, opinions and experiences—and from different generations—will come together to collaboratively reflect upon urban-rural sentimental and ideological constructions of longing so as to make a contribution to an open conception of Heimat (“home”). The “exhibition as research setting” will include a multi-media research station, inviting citizen scientists to actively engage with the image corpus of Stadt-Land-Bild. Even though the research station can be easily explored autonomously, the program builds on intergenerational picture talks as well as guided workshops and open research sessions at peak museum times. Citizen scientists can play the social image tagging game ARTigo, and work with the social image analysis tools offered by the ARTigo Analytics Center. Essentially, this means that participating citizen scientists will be both describing images and statistically analyzing the descriptions given by themselves and others. No prior knowledge of any kind is needed. Everyone, irrespective of age or educational background can contribute to the project and become a citizen scientist when they visit the exhibition. Going beyond simple screen presentations, visitors can explore the images of Stadt-Land-Bild within a physically appealing three-dimensional setting built of expansive and interactive touch-screen walls. Stadt-Land-Bild continues the intergenerational and dialogical research focus of the Sparkling Science project Stadt-Land-Kind. It offers the possibility of participation to citizens of all generations, to children/adolescents, adults/parents and senior citizens/grandparents. It will establish research cooperations with at least 250 citizen scientists. Stadt-Land-Bild will allow open access to a much larger number of citizens not only during the museum’s opening times but through online participation as well.